Tank monitoring is an ongoing project as I have yet to find a reliable solution. Here’s the story. New Morning has nine tanks: four fuel storage tanks, a fuel day tank, two freshwater tanks and two blackwater tanks. With two key exceptions, they are wide, shallow and irregularly shaped. The two important exceptions are the primary water tank and fuel day tank which are both essentially rectilinear and reasonably deep. I began with nine tank level sensors from Offshore Systems which were connected to the NMEA 2000 network. The system also included an Offshore Systems MultiTank display and Fuel Transfer controller. There were actually three different types of sensor, one for diesel, one for freshwater and one for blackwater. Unfortunately none of them reliably reported the level of fluid in the respective tanks. Sometimes they read more fluid than was actually present, sometimes less. And the day tank was just plain erratic. Offshore was responsive to my inquiries, including replacing several sensors at no charge, but the problems persisted. After we ran out of fuel while the tank display read 23%, I realized I had to make a change. Since I wanted to keep the sensors on the NMEA 2000 network, the next product I tried was the Maretron TLM100. After a variety of problems with mounting the new sensors, I finally got the right set of adapters and was able to install them on the day tank and two blackwater tanks. 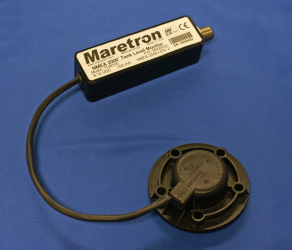 The Maretron sensors are ultrasonic with no moving parts or probes, but have a 2” deadband below the sensor itself. There are no standards for sensor calibration in the NMEA 2000 world so each sensor (tank, wind, speed, etc.) usually requires the manufacturer’s own display device to perform the calibration. Fortunately I already had a Maretron DSM250 so I replaced the Offshore MultiTank display with the DSM250 to enable calibration of the Maretron sensors. Since the blackwater tanks are only 7” deep, and wedge shaped, there isn’t much room for a precision reading. And the last 2” that the TLM100 won’t read is the portion of the tank with the greatest capacity. So when the sensor reports the tank as 100% full, there is actually more capacity, but of course we never know just how much. And with a blackwater tank, an overfill is not pleasant! The day tank was a different problem. 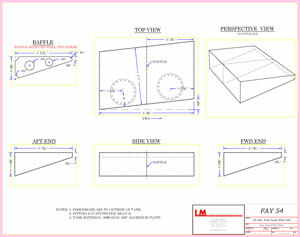 Maretron recommends a “focus tube” on a sailboat to maintain accuracy when heeled. While the sensor bolted right into the SAE 5 bolt pattern on the tank, the focus tube had a larger diameter than the existing hole; so no focus tube. Not a problem, we tend to motor when the seas are flat so heeling is not a big problem. So far the sensor seems to accurately report the tank level, except during one critical time. While New Morning was under construction in Maine, a professional captain started filling the fuel tanks of a large motor yacht. Unfortunately he was distracted by something else and eventually went home with the fuel hose still pumping fuel into his tanks. The next morning a considerable amount of diesel fuel had flowed into the St. George river. 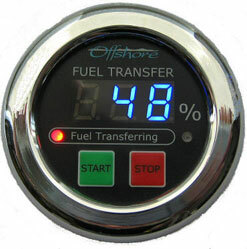 Since I am also easily distracted, the Offshore Systems Fuel Transfer controller was developed in response to my suggestion. The controller is connected to the NMEA 2000 network with a switch to start the transfer and then shuts off the pump when the tank is 95% full. However, when filling the tank, the Maretron sensor seems to get confused as the tank fills and once it reaches about 80% the tank level readings go down until it reports 0%! When I stop the transfer and wait 1-2 minutes, it returns with accurate readings. Maretron has no explanation at this time, but I suspect that foam in the fuel in confusing the sensor. In any case, it completely defeats the automated fuel transfer controller and requires a start/stop procedure to fill the last 20%. So I’m 0 for 2 on NMEA 2000 tank level sensors. Next I’m, going to try combining an analog sensor such as those from WEMA or Vetus with the Maretron TLA100 to put the data on the NMEA 2000 network. Update: I’ve been using a WEMA analog sensor connected to a Maretron TLA100 since December of 2010 and it’s working very well. However, the resistance of the WEMA sensor is not linear along its length. It was necessary to measure the resistance at each 1” of its usable 14” of length, then build a spreadsheet to calculate the actual tank level relative to the pickup tube and finally enter the calibration table into the TLA100. The WEMA gives me an accurate read on the tank level and the TLA100 makes it available on the N2K network.